I've been busy making more copies. I've also been thinking about finding an event where I can table with the zines, so please let me know if you have any ideas. I could just set up with a TV tray somewhere around town at a community event (I have a pretty cool vintage TV tray, in fact). When I think about what's happening to people--and especially kids--at the hands of our government, I feel small. And I feel very, very angry. I was heartened when I learned about Immigrant Families Together because it is a group of individuals who are pitching in to help people get out of ICE custody and rebuild their lives. I wish we could change government policy and get rid of ICE and its "detentions" and family separations. I ask my government officials about this regularly. I protest about it, too. In the meantime, I feel like the most practical thing we can do while these policies continue to detain and hurt people is to try to help get people out of detention, one at a time. This is far better than doing nothing as we wait for policy to change. Kids in particular should not be locked away because their families crossed the border into the US. IFT is doing the practical work of getting people out from behind the bars and wire and fences of imprisonment. 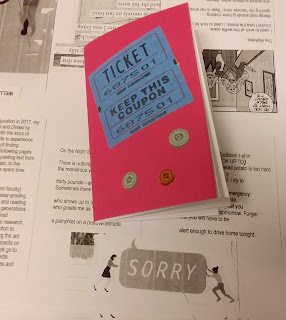 It feels small to be making a tiny zine, too, but I think it's meaningful to contribute even in the smallest way. What if everyone contributed to this effort in their own way, using their own interests and talents? Could we empty out the detention centers?